A young boy kidnaps his sister's bunny and ends up with a time out. When the bunny and the boy's beloved stuffed raccoon go missing, the family ends their day by going to bed without stuffed animals. The next morning, the boy discovers that a clever and curious raccoon has stolen the toys and his blanket. The illustrations reveal the raccoon's troublemaker ways from the beginning of the story and young readers will enjoy following this important plot line. I think this is a great text for introducing the idea of the Boy Who Cried Wolf -- young listeners will be able to understand why the family doesn't believe the boy after he steals the bunny the first time. Recommended for preschool through kindergarten. The real raccoon is the rascal. I think those kids who feel they always get blamed for something they didn't do will latch onto this book. I felt the simplicity of the text was not as strong as the story through the illustrations. 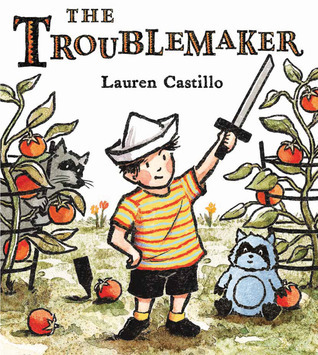 The Troublemaker by Lauren Castillo (Clarion Books, 2014)Publisher’s age range: Ages 4-7My recommended age range: Ages 4-7Castillo uses bold lines, bright colors, and dramatic shadows to tell a familiar story of a boy who likes to play tricks on his sister. The drama builds when the boy himself becomes a victim of a trickster and learns a lesson about empathy. The Troublemaker would be a fun storytime read and could be used for lessons about making predictions as well as to introduce conversations about empathy. With sharp contrast on each page to add visual appeal, a humorous twist, and a lovable villain, The Troublemaker will have wide appeal among the target age group. Things are disappearing from the yard and the house, but it's not the boy in the family who is doing it, when he initially gets blamed.This was a nice book with nice illustrations. Not exactly my vibe, but it has a strong Calvin and Hobbes summer nostalgia feel that makes me want to push it on others anyway. Little boy is playing and they think he is the troublemaker. But the real troublemaker is discovered in the end. Told in the first person, this picture book is from the point of view of one bored little boy. He and his stuffed raccoon decide to play pirates. To do that you had to not only be sneaky but you also needed a prisoner, and his sister’s stuffed rabbit was quickly stolen and sent afloat in the lake. The boy was scolded and the now damp bunny was returned to his angry sister. The boy then spent time playing with his own toys, but soon his mother was asking if he’d taken the bunny again. He hadn’t but no one believed him and then his stuffed animal went missing too! It was a real mystery and now they had a real pirate on their hands.Castillo takes a classic book of summer boredom and then picking on a sibling to a different and surprising place in this picture book. Children who are paying attention will notice a furry face that appears on almost every page in the background, a lurking raccoon who seems to want to get involved or maybe is having his own dull afternoon and is looking for some fun. This second little troublemaker adds a great amount of fun to the story. Even better, having dealt with raccoons invading my house and stealing my son’s stuffed animals up into their attic den, this all rings completely true.Castillo’s signature art style is on display here. She manages to capture a timeless look on the page but also one that is modern and fresh. The tinge of blue on the stuffed raccoon make sure that children will not mix up the real and stuffed animals. The family’s home is well detailed, busy and filled with other natural touches.A solid new title from Castillo that will work well for units or story times about pirates, siblings or raccoons. Appropriate for ages 3-5. Summary:The Troublemaker is about a little boy who's bored when playing outside one day. He decides to play a game of pirates with his stuffed animal, Rascal. He gathered up a rope, a blindfold, and the last thing he needed, a prisoner. He snuck his sister's stuffed bunny to use as the prisoner and sent him out to sea, which was the stream in his backyard. When mom found out what he had done, she was not happy. He apologized for taking his sister's rabbit. He was playing nicely on his own, when he heard his mom calling his name. The bunny had gone missing again and his mom and sister did not believe him when he told them he didn't take it this time. His mom told him to stay in the garden where she could see him, and while he was collecting tomatoes, he noticed that Rascal and his boat were missing. He went to sleep that night feeling sad and missing Rascal. When he woke up, his blanket was missing too! He heard a noise outside and went to the window to check it out. A sneaky raccoon had taken all of their stuff. What a troublemaker!Activity:-The teacher will have the students get into groups, with roughly four students in each group.-The students will create a Venn diagram, comparing and contrasting the boy and the raccoon.-The teacher will have the students share their Venn diagrams with the rest of the class.Citation:Castillo, L. (2014). The Troublemaker. Boston, MA: Clarion Books, Houghton Mifflin Harcourt. What's a little boy to do when he is bored? Why, bother his sister of course! The maincharacter in Lauren Castillo's The Troublemaker decides that he is a pirate and decides tocause a little mischief. Along with his trusty sidekick, Rascal, his stuffed Raccoon, the little boy plunders some rope (his sister's shoe lace), a blindfold (his sister's scarf) and prisoner (his sister's stuffed bunny)! Soon the little pirate gets caught by Mom and needs to give everything back. He seems to have learned his lesson but when bunny goes missing again, the little boy is the the number one suspect. That is until Rascal also goes missing. Who is the real troublemaker this time? Castillo uses minimal text to tell this delightfully funny story. However, her clever pen and ink and water color illustrations add so much more and tell the story of the real troublemaker. Recommended for a pre‐K‐2 audience. A little boy whose family lives on the edge of the woods decides to steal his sister's bunny for a joke. He gets in trouble, so he returns it. Then, the bunny gets stolen again, but the boy knows he didn't take it! And not just the bunny is missing, his own stuffed animal and some other toys disappear! Who could be the thief? Observant readers will know at the beginning who the thief is, and may be able to spot the next thing to disappear before it happens. Though the "mystery" is fun, I think the best part of this book is when the little boy is missing his stuffed animal at night and realizes how much his sister must be missing her bunny too. That frame is worth the whole book, as the boy is sorry for what he did earlier and thinks of someone else when he's unhappy. Simple words, kind of an old fashioned look for the pictures, which were fine, but didn't draw me into the story as much as they could have. No content issues. After kidnapping his sister's bunny while playing pirate, a little boy finds himself again accused of taking the toy but this time he didn't do it. Then his own raccoon toy goes missing. Who is the real troublemaker?A light "mystery" for little kids. Careful observers of the illustrations will be able to figure out the true troublemaker. This would be a fantastic book for practicing making predictions. I was totally wrong in my predictions of who the troublemaker was from the cover and opening pages, and had to revise my predictions. This is also a good book to use when talking about character and how our actions of the past can impact how people trust us in the future. As always, Lauren Castillo's illustrations are adorable and wonderful. And I loved that the little boy had named his toy raccoon after another famous literary raccoon, Rascal. A little boy with nothing to do decides to borrow his sister’s things to play pirates. The little boy and his stuffed raccoon Rascal have a great time until things start to disappear. Mom and sister blame brother when sister’s stuffed bunny ends up missing, but pretty soon all the boy’s toys are missing too. Maybe the sneaky real raccoon has something to do with all the missing items. This book would be great to use in story time. The children could help figure out who was taking the items and help locate the sneaky raccoon throughout the story. The black and white images offer a nice contrast to the bold, colorful illustrations and tell a story all on their own. Anyone who grew up with a sibling will appreciate this story of sharing and getting in to trouble. Someone stole little sister’s bunny and a bunch of other stuff. Little brother gets blamed for all the trouble but he swears he’s innocent. Well, except for the time he tied Bunny to the boat in the water … Funny thing is, the sneaky little thief hides in plain sight on almost every page, giving readers with a keen eye for details the chance to solve the puzzle on their own. The delightful scene at the end shows that even though the mystery is solved, the troublemaker has other plans. Brothers and sisters – little and big – will get a kick out of the mischief and mayhem in “The Troublemaker.” And little troublemakers everywhere will feel vindicated. That rascally raccoon! The reader can see the raccoon sneaking around, spying on the children on several of the pages, and also watch him make off with various stuffed toys. The illustrations, done in pen and ink with acetone transfer and compiled digitally, are brightly colored, except for the pages which are a black silhouette. The illustrations show actions that are not specified in the text, such as the raccoon making off with the toys. Young readers will be amused by the raccoon's thefts practically under the noses of the two children. This would be a good choice for a story time. I really liked this book! The illustrations are beautiful and reminded me of woodblock prints, a bit retro and classic. The story is simple, a young boy is bored on a summer afternoon while his family is busily engaged around him. The decides to play pirate and capture his sister's bunny. This lands him in hot water with his parents. But when the bunny disappears again, no one believes he didn't take it...and then his things start to disappear. Who is the troublemaker? Young children will be in on the secret through the illustrations and will delight in the behind the scenes action. This book is a lot of fun to read. Kids of all ages can relate to being bored and having fun with a sibling's prized possessions. But when everyone's stuff, including the little boy's, starts disappearing, the mystery begins. The true culprit is another one that most homeowners can relate to! The illustrations really draw the reader into the story, especially as we are aware of the true thief! You can see the bandit in the first silhouette illustration! My favorite is the picture showing the creature at the little boy's window in the moonlight! This book is awesome for everyone! -love the black and white silhouette images interspersed with the other illustrations (especially the pirate one at the beginning)-pen and ink, but illustrations have a print-like quality to them-also a slightly retro feel: a family spending the summer day outdoors, doing old fashioned activities like a doll's tea party, gardening, etc. (how a day should be spent! )-water and fir trees seems like Maine setting? A book that was published in 2014, this book details how a young boy was causing trouble, and then got punished for that trouble, (in addition to some things that he didn't do!) When things start to go missing, the boy finds out that while everyone has been blaming him, it has actually been a raccoon the whole time! This books is told from a traditional literature standpoint, and younger students will definitely enjoy it. What happens when you play pirates and kidnap your sisters Bunny? You get a time out. But what happens when he goes missing again and other strange things start to occur? How do you catch the culprit and prove your innocent? Read the book. This is a funny story that revolves around Bunny and his new friend. I love the classic style of Lauren Castillo's artwork in this book. She alternates full-color pages with silhouettes, and I think this really helps to tell the story.A little boy is bored, so he steals his sister's bunny and sends it on an adventure, only to have the tables turned on him later on by an even bigger troublemaker than he is!Very amusing. I am a fan of Castillo's illustration style (she also did 'City Cat'). She works with pen and ink, and the finish is a bit like watercolor painting. This is a cute story about a trouble-making raccoon-- and an opportunity to build visual literacy for careful young readers. A solid pick for ages 2-6. Take one bored little boy with an active imagination, add a sister with a favorite stuffed animal, and you have the recipe for...trouble. But this is one troublemaker who has met his match! This is a really fun story and I think kids will be able to relate to the boy, and they will definitely enjoy following the antics of the true troublemaker in the story! I love the illustrations in this one. It's a charming tale of a little boy who takes his little sister's stuffed rabbit and gets in trouble for it. When it goes missing again, he is thought to be the culprit, but then his stuffed raccoon, his boat, pirate and the rabbit all disappear. You will have to read the book to find out who the real thief is. A young boy kidnaps his sister's toy rabbit out of boredom. When other special items begin to disappear, the boy realizes there is a second troublemaker in the area. Observants readers will quickly spot the second troublemaker. A wonderful story to share! A fun book to talk about misbehaving. Kids will love figuring out who the troublemaker is and it can be read twice once they figure it out. They can find all the clues in the illustrations the second time. My K-2 students really enjoyed this one! Lauren Castillo - Lauren studied illustration at the Maryland Institute College of Art and received her MFA from the School of Visual Arts in New York City. She has written & illustrated over 14 books for children, including the critically acclaimed Melvin and the Boy, The Reader by Amy Hest, Happy Like Soccer by Maribeth Boelts, Buffalo Music by Tracey Fern and What Happens on Wednesdays by Emily Jenkins. Her most recent book, Nana in the City, was awarded a 2015 Caldecott Honor. She currently draws and dreams in Central PA.